Winner of the Tourism Tasmania Awards - Best Standard Accommodation for 2006. Well appointed 3.5 star clean and comfy retro styled accommodation situated on the blissfully quiet Inglis River in Wynyard. All rooms have shower ensuite facilities, free cable television, and high speed internet access and tea and coffee making facilities. 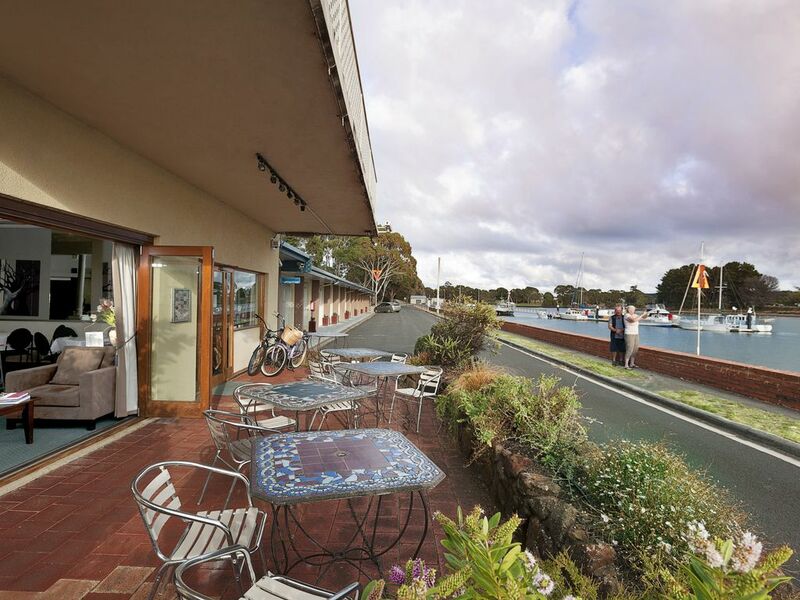 We have a fully licensed waterfront guest lounge area, with cosy log fire and beautiful views across the Inglis River. We provide an excellent daily continental and cooked breakfast in our guest lounge area, with freshly baked goods, housemade mueseli and fresh fruit. The Waterfront Wynyard fronts the Inglis river and views out to Bass Striat. This is a great place , lovely rooms ,top position. The proprietors are very nice and welcoming. We have thoroughly enjoyed our stay here and highly recommend it. Nice and close to the Main Street and the waterfront, with tidy, well-stocked rooms. My dog and I were made to feel very welcome and had a nice relaxed stay. Great location, friendly helpful staff, clean comfortable room and pet friendly too. We enjoyed hosting Kate and her pet they were great guests and we look forward to welcoming them back to The Waterfront again in the future. Most comfortable stay,great staff and they made our dog Lucy welcome. We look forward to returning. Very clean, comfortable and well-maintained accommodation at a reasonable price. Very friendly and helpful staff who make their guests feel at home. Onsite, we have The Guest Lounge and Bar that operates from Monday to Thursday and serves light homestyle cooking in a casual dining atmosphere. Our Guest Lounge is also open for breakfast from Monday to Friday 7.30am-9.30am, and weekends from 8.00am - 10.00am. - "The Wharf Hotel" behind our property at 10 Goldie street, offers great 'pub grub' and just a minute from the motel. - "Annie's place" is located at the bottom round about and serves excellent bistro style meals, and is about a 2 minute stroll from your door. - "Purple Sage" across the road from "Annie's Place" serves local produce in an ambient restaurant atmosphere. - For something more fancy pants- head back into Burnie to "Bayviews" on the Burnie waterfront terrace. - And of course what seaside town would be complete without an excellent fish and chips venue- which is right on the wharf next door "Wynyard Wharf Seafoods". Fresh fish straight off the boats. We offer charge back services for both Annies place and the Wharf Hotel. If we can help with bookings, please let us know! Hard to beat our coffee at breakfast, but apart from us, in Wynyard head to either "Cafe Umami" in the main street or "Bruce's" cafe further out of town heading back to Burnie along the old Bass highway. "Cafe Umami" also offer a completely gluten free cafe experience and a very tasty range of paleo options. A little further down the road on the main highway towards Boat Harbour, be sure to stop off at "Illume" cafe and restaurant. Great selection of local produce cooked really well. In Burnie its very hard to go past the trully excellent coffee served at "The Chapel" at 50 Cattley Street. - Easy day trips to Cradle mountain, Stanley, Smithton, Marrawah and Arthur river. - Scenic drives along the coast- make sure you ask us about the best trips to do when you check in. - Deserted beaches to walk along and contemplate life. - Excellent waterfalls and walks within short distances to the motel. - Beautiful gardens to explore and tulips in spring time- book early for Tulip festival in early October!